Note: If you have not played this game, do not read this article. Play the game, enjoy it, and then read this article. It could mess up (a little) the joy of discovery (contains spoilers). Let me bear in mind that the game was released at the end of the PS2′s era, pushing it to its limits in terms of graphics. But if the technology was very advanced for this console, it is not the graphic engine that left its mark on the players, but the beautiful art direction of the game. 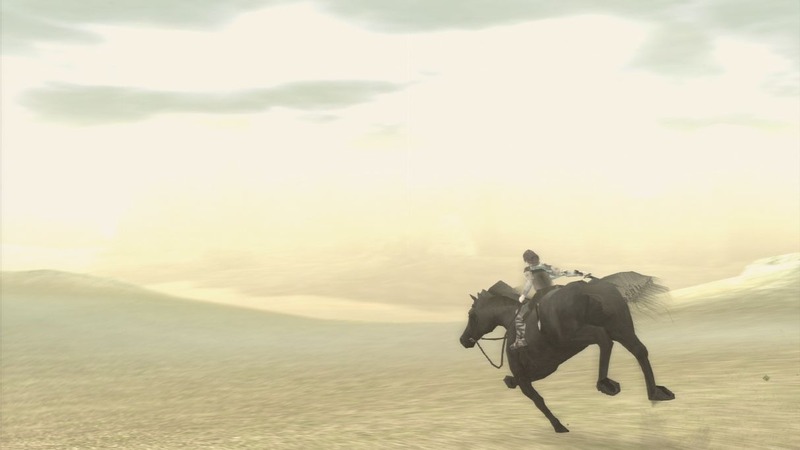 Let’s see what the visual peformance adds to the Shadow of the Colossus experience. 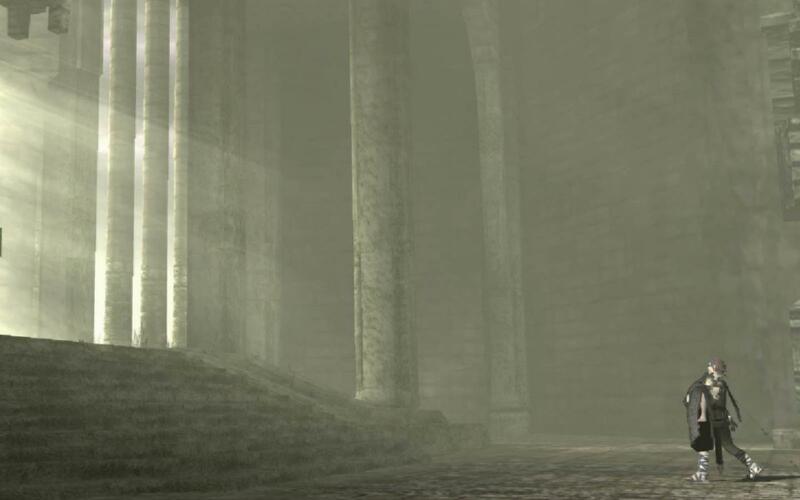 Light constitutes one of the most important components of the game, both visually and gameplay-wise. 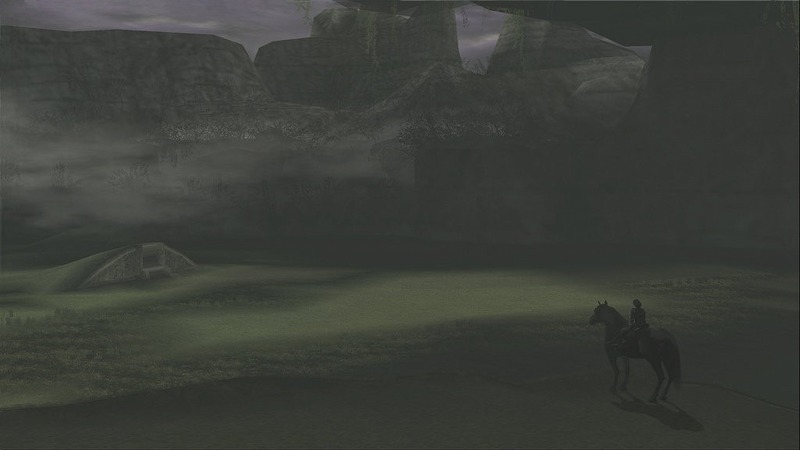 At the graphical level, from the start of the game, the light is omnipresent. 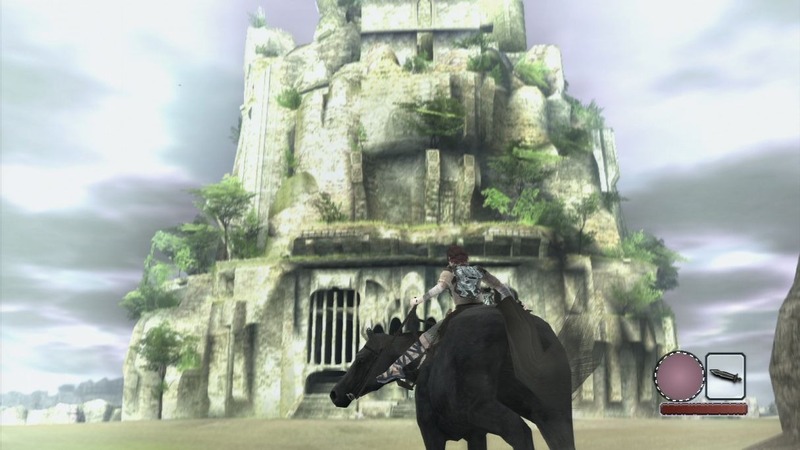 In the sunny scenes, we can see a visual rendering where the textures of the ground or rocks seem burned; the sky seems flooded with sunlight; a bright haze takes shape far off and seems to mask the rest of the landscape (this point being more present on the PS2 version than the HD remake on PS3). This overwhelming light strengthens the desert aspect of the place, emphasizes the feeling of vastness of the setting (see the paragraph “vertigo”), and seems to merge all colors together, thereby reminding the style of the painter William Turner. Analysed through to these criteria, the light does not seem welcoming. It can deceive the player in his sensations. It is also necessary to remember that the god who is at the heart of the intrigue is visually represented by rays of light (he also refers to it several times), which suggests a link between both (the god and the light). In the same way, it is the light reflected by the hero’s sword that indicates which direction to take, or the weak spots of the giants. This light seems to be a gift – or at least under control – of this god, of whom we know nothing (until the very end), nor of the real power over the elements of this mysterious place. We eventually dread the absence of light, and the player is from then on forced to deal with it, in the same way as Wanda blindly obeys the God, with the disastrous consequences we know (if we finished the game, at least). A lot of work went into modeling the game. It should be noted that the modeled objects are all of a remarkable size. Nothing seems to have been made for a human being: temples, statues, bridges, columns… all seem to have been modeled for greater than normal beings (at least in our standards), which reinforces the sense of a “larger than life” adventure. Work on modeling can be split into two parts: the work on the sets, and the creation of colossi. Regarding the sets, in addition to their gigantism, it is their design that stands out. They seem to come straight out of western architectures, from antiquity (temples, arenas, Coliseum, columns, bridges) and Middle Age (castle), pre-Columbian era (The statues in the temple, that remind the Aztecian divinities, like Quetzacoatl) and even asian architecture (like the shrines which resemble southeastern asian pagodas). These monuments in ruins appear to be relics of the past, giving us the impression that this place could actually exist somewhere in the real world, away from home in a long-forgotten region (which must be even more true for Japanese players). But at the same time, they are sufficiently well preserved to immerse the player into a world of (almost) living myths and legends, where some reminiscences of the past still survive. All these remarks are sublimated by the appearance of the colossi, these gigantic monsters that seemed to have been asleep for centuries, a sort of animal-mineral-vegetable blend. 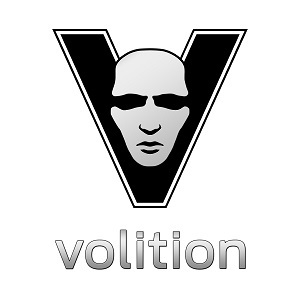 Their visual design systematically brings the player back to known concepts (such as a real or mythological animal, the appearance of a Greek god or that of a robot). Yet, their constitution makes them extraordinary, whether it is by their sheer size or the materials they are made of. All these aspects leave no doubt as to their divine origin: they cannot have been created by humans. These chimeras reinforce the idea that the hero (and through him the player) has discovered the one region in the world where we can find the last vestiges of an otherwise vanished mythology. In conclusion to this chapter, I would like to mention what, to me, best defines the sensation inspired by the visual design of the game: vertigo. Obviously a vertical vertigo when flying over a pond on the back of a flying colossus; when we are tossed, hanging to a few head’s hairs of an annoyed colossus; when you cross a bridge over the void, or the top of a mountain, looking downwards on a lake below. The verticality is found everywhere, but this is precisely what can be expected from a game setting a human versus giants as tall as buildings. We find the same feeling in the height of the main castle and mostly in the abyssal depths of the lakes in which we must often fight (personally, this is the most frightening moments that I could live in-game). 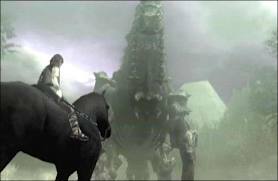 And what about the last colossus that synthesizes everything we experienced in an endless climbing to reach him, and then an even more difficult sequence to reach its summit. 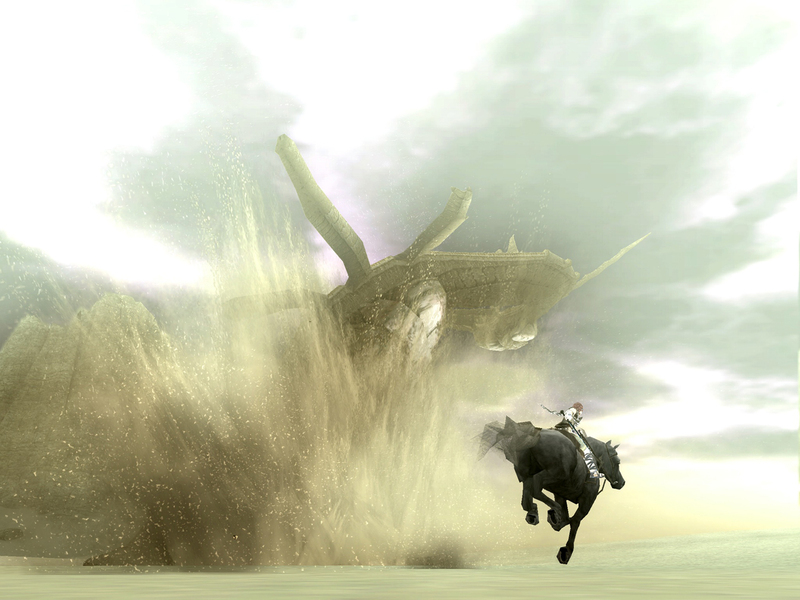 A “horizontal” vertigo caused by the size of the landscapes, the extraordinary length of some monument (the bridge from the introduction, the length of the temple), the size of some colossi (the “sea serpent,” the “dragonfly”) that must be crossed in their entire length to reach their vital points. And above all, the play of light that confuses the distances, blending colors, suggesting intense heat or strong wind, and creating a depth-of-field kind of blur. Finally, a “temporal” vertigo due to the presence of elements that seem close to us by their appearance, but mythological by nature and excessiveness. This world seems both historically plausible in some respects, and at the same time completely out of time by others. There is much to be said about the visual aspect of the game, including from the point of view of more traditional arts such as painting, photography and cinema. The parallel with the paintings of William Turner is very insteresting. But the sound design, especially music, makes no exception, as we shall see in the next section.